I got in eight matches in Warsong Gulch and came out with five wins and jumped from level 11 to 14. I'm also curious how WoW's stat tracker works. It says I've done fifteen matches in Warsong Gulch, I've only done eleven, I'm just wondering how that works. The first match of day two I was stuck with a group that had zero interest in going after the Horde flag to win. This group wanted a big fight in the middle to farm HK's and nothing else. It was a stupid loss and I hate getting put in groups with that mindset. In the second match we had a druid on the team that kept the flag for almost ten minutes, he could have capped it at anytime, the Horde was never able to get far with our flag. While this joker had our flag, we began camping the Horde graveyard. Camping the graveyard is a fine strategic tactic, but there is no sportsmanship in it. However, this is war, the Horde have been encroaching further into Ashenvale and devastating swaths of land, I will no longer tolerate their incursions. Back to the druid, as soon he scored the Wrecking Ball achievement he dropped from the battleground. It didn't hurt us any, we were never in a position to lose as we won 3-0, but it was still a jerk move. The third match was nearly perfect, winning 3-0 in under seven minutes. 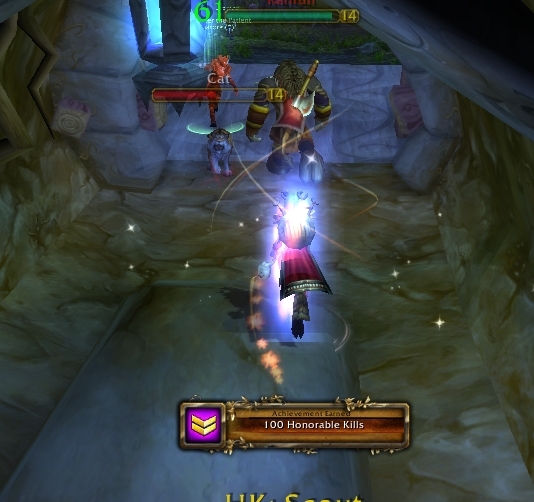 I didn't have to do much, we had two druids that were on top of ganking the Horde flag and getting them capped and we had healers to spare. The first match of day three was a slow and steady win, capping 2-0 when time expired. It was nice to be grouped with other players that worked well together, called out what needed to be, kept our flag carriers protected, giving nods when somebody did a good job, no bitching or trolling, just a great display of teamwork and how a battleground should be done. 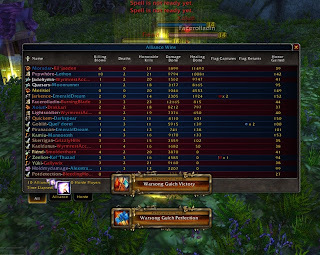 The second match was already in progress and the Horde had already capped once. This was the exact opposite of the previous match. The Horde us held up in the middle and it was total chaos. 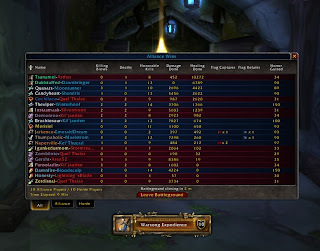 Guess the highlight of the match was how at least half of the Horde started concentrating all of their firepower on me, allowing at least some of the Alliance players to get by and make runs on the Horde flag but time was already against us in the loss. The third match was very much like the first, decent teamwork leading to slow and steady 3-1 win. 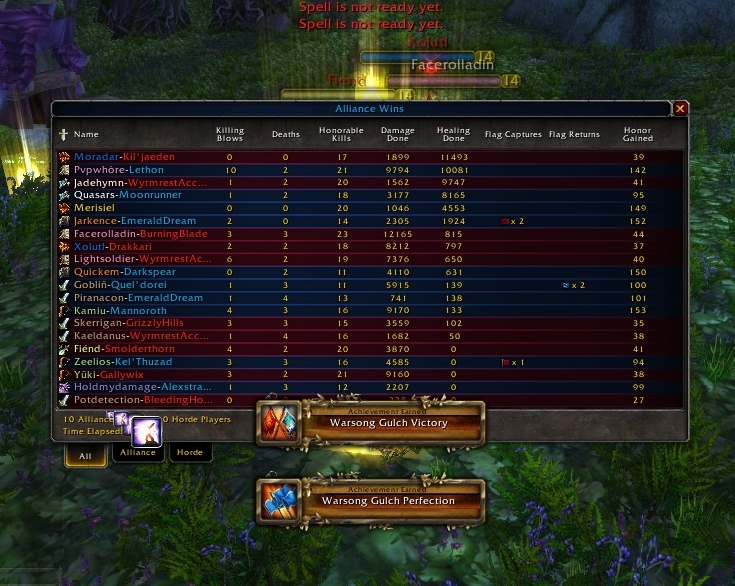 We were overloaded with healers and for all the damage the Horde was causing, it wasn't bringing any of us down. Day four, I'm getting used to being the center of attention. First match was a bad, bad loss, I had a lot of squishy teammates. We couldn't get anywhere, people were dropping faster than I could heal them. The Horde side had four rouges, four shaman, a paladin and a monk, all sporting heirlooms of some kind. The majority of my team was in nothing but white and green gear. This match couldn't get over fast enough. I was constantly getting ganged up on by four or more Horde players and they hit a lot harder than I've seen over the last few days. maybe just better coordinated and had better knowledge of their characters. Match two was a good win, solid teamwork, we were able to maintain a perimeter across the middle preventing the Horde from getting past us. I had a pretty sturdy team, was throwing out heals that was never in great need and ended up throwing out some dps and got some killing hits in. I'm not far from dinging level 15, once there I'll be turning off the experience gains and start farming some gear then get back into it. Not looking forward to adding Arathi Basin into my battleground activities, the map stinks and in the past I have not seen much teamwork going on.